1 Iya sat by the stream. It was really more of a creek than a stream. The shallow water trickled between stones. Only a few small fish could wiggle their way between them. 2 Iya liked this place. She was small enough to hide under the marshy ferns. She liked the stones of the stream bed most of all. Some were quite large. Many were very small. The ones she liked best of all, though, were the smooth ones that fit in the palm of her hand. 3 Today, she counted herself lucky. The storms last week had washed down new stones from upstream. She looked at the rock in her hand. At least, it looked like a rock. 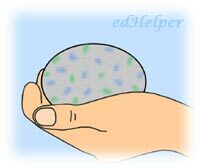 It was gray and smooth like the other round stones, but it was speckled with blue and green. 4 Iya slipped it into her pants' pocket. It would be safe there. It would be good to add to her rock collection. 5 The path through the trees to Iya's yard was steep. Partway up she stopped. The gap in the trees let her look over the ravine. She put her hand in her pocket and pulled out the stone. 6 It felt warm, warmer than it should. Then she felt it move slightly. Iya almost dropped it. Then she gave it a little shake. What could it be? 7 The sun shone down where Iya stood. It is uncomfortably hot standing here, she thought. Would the stone still move if she stood in the cooler shade? 8 She took just two steps sideways and into the cool shadow. The stone slowed its movements, slower and slower. Iya was worried. She held it in the heat of the sun once more. The blue and green flecks were changing. They formed thin jagged lines. Iya held the stone close to her eyes. What was this thing? 9 Then she heard a sound and felt a tap through her fingers. Could this be an egg of some kind? She'd held eggs that were ready to hatch before. Miss Smith, her teacher, had hatched some chicks in class. This was nothing like a hen egg. Was it a snake egg?